Things are coming to a head and the House will likely vote on the reprehensible AHCA at some point today. It's all hands on deck to try to stop this monstrosity. Here's what you need to do today AND tomorrow. TODAY: Call your Representative and urge him or her to vote No. Find your Rep's number(s) here. You may have to call more than one office to get through - phones are bound to be jammed all day but keep trying! Sample script is below. 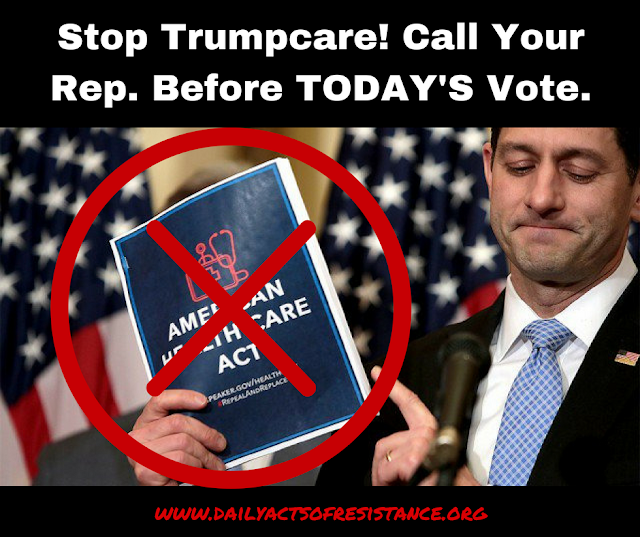 "Hi, my name is ____and I'm calling from _____ to urge Rep. NAME to vote NO on Trumpcare when it comes to a vote today. I'm very concerned by the CBO's findings that the AHCA would result in 24 million Americans losing health coverage, including tens of thousands who live right here in our district. If you get your coverage via your state's ACA marketplace, you should definitely mention that now -- "I get my health insurance through the ACA and I am scared that I will lose it." I will definitely be watching to see how Rep. NAME votes today and will remember it when I cast my vote in 2018. Thanks for taking my call." TOMORROW: Call your Representative and, depending on how he/she voted, either thank them for standing up for your health or let them know you're deeply disappointed and will not be voting for them in 2018. Sample scripts are below for each scenario. Hi, my name is ___ and I'm a constituent from ____. I'm calling to let the Representative know that I am extremely disappointed in his/her vote in support of Trumpcare yesterday. It is perfectly clear from the CBO's report that this bill will be a disaster for those in our district and America, as a whole. If Rep. NAME truly wanted to represent our best interests he would have voted NO. I will remember his/her vote when I cast my vote next November. Thank you for taking my call. Hi, my name is ___ and I'm a constituent from ____. I'm calling to let the Representative know how much I appreciate his/her vote against Trumpcare yesterday. It is perfectly clear from the CBO's report that this bill will be a disaster for those in our district and America, as a whole and I am grateful to Rep. NAME for representing my best interests and those of everyone in our district. I will definitely remember his/her vote when I go to the polls in 2018. Thank you so much taking my call. Please don't stop there - you should also submit a comment via their web site and contact them via Facebook and Twitter if you use social media.